Support for research and development in information technology is considered today as critical by most governments in the industrially advanced countries. Traditionally the way of stimulating research has been to ensure to the investor the appropriability of the returns generated. Such appropriability is typically implemented by means of the Intellectual Property Rigths. Nevertheless the protection of such rights is heterogeneous worldwide. Today two different legal systems for the protection of software coexist: the system of patents and the system of author's copyrights. Chapter 8 explains these two main systems of ‘intellectual property’ to provide legal protection to a software, including the licenses to transfer rights on software. The end of the chapter presents the most recent trends of the EU government to replace the current European software protection system, including a discussion onf the software patents and the legal initiatives on the subject. 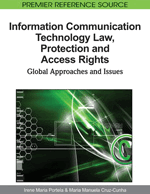 In addition, legal issues linked with new ways in software comercialization are presented. Originally, hardware and its corresponding software constituted an indivisible package and the use of early computers was limited to people with solid knowledge in computation, generally scientists or engineers. It was then quite typical for developers to share, interchange and improve software programmes freely: therefore, at that time, software was freely available and shared, not like a commercial transaction but as a personal favour. By the end of the 1970s, however, companies began viewing software as an independent product, and they commercialized it independently of the hardware by means of licenses agreements. This strategic move had its origin in IBM's decision of separating the production from software and hardware as a consequence of the pressures exercised by the USA anti-trust authorities (Mowery & Rosenberg, 1998). Consequently, a new product of a nature entirely different from the hardware appeared: while hardware is a physical or tangible asset, the software presents a logical nature, and therefore it became necessary to look for a new system of legal protection. Initially in order to protect such products, companies decided to block access to the source code They also decided to shield their projects in confidentiality terms to avoid the flight of industrial trade secrets. This new working environment gradually limited the cooperation between programmers and created specific niches according to the necessities of the market. Nowadays, governments of developed countries consider as extremely important for research and innovation in information technologies to position it as the masterpiece of the industrial economic and social development (Kalakota & Robinson, 2000). Information systems and specifically software are, nowadays, omnipresent in all the human activity's spheres, contributing in the surging, consolidation and future projection of the Knowledge Era or Third Wave (Toffler, 1980). The information is, from this perspective, the main asset for the development of the developed economies, and the software the instrument per excellence to treat the information (Faramarz, 2001). Traditionally, the way of stimulating research and innovation, in any industrial or economic field, is to allow an investor to be involved in the appropriability of the benefits generated by the investment. The appropriability of products and benefits generated by an investment is materialized by the concession of property rights to the investor. These property rights are appropriate not only to protect the material or tangible assets, but also to intangible or immaterial assets, specifically intellectual assets. Among these intellectual creations, new technologies, and specifically software, occupy a significant role because of their incidence on the development and well-being of modern society. In addition, software has an economic meaning in the sense of production means and as a product. The software industry is related to the codification of knowledge and information, its inputs and outputs being virtually immaterial. The outputs can be products or services, depending on the form in which they are provided. As an intellectual product, the way chosen to protect software was the Intellectual Property Rights. The majority of software was already intellectual property by the ‘80s. copyrights in the European Union (EU) and South American countries. Within this environment, the discussion on the allocation of rights on software has going on within the information systems industry practically since its birth. However, in the 80’s the debate intensified about creating appropriate normative frameworks to protect software by means of patents or copyrights.